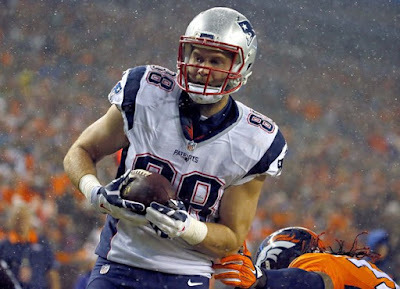 Of all the players that came into the program last offseason, no one had more buzz than tight end Scott Chandler. Chandler, who burned the Pats plenty of times as a member of the Buffalo Bills, was brought to New England on a two-year, $5.3 million deal, and the hype surrounding the player made fans giddy with excitement that the offense had another legitimate tight end to pair with The Mountain AKA Rob Gronkowski. But as we saw, Chandler was way less than advertised. He plays a very timid game for being a 6-foot-7, 270-pound behemoth, never mind the issues he had hauling in the passes thrown his way. He finished with just 23 catches for 259 yards and four touchdowns, but it was down the stretch when injuries began to take their toll on the offense where Chandler really disappeared. The 30-year-old caught a grand total of zero balls in his final five games of the season, while he was inactive during Week 15 against the Titans with a knee injury. Chandler is slated to count $3.05 million against the cap in 2016, and if the Pats choose to release him between now and April, they'll save $2.05 million in cap space. In exit interviews on Monday, Chandler stated that he wants to return to New England next season, even if his first year with the team didn't exactly pan out the way everyone expected. “I came here because I wanted to play on a winning team,” Chandler told Jeff Howe of the Boston Herald. “I had four years in Buffalo where I got a start, but everything was about the team here. It wasn’t about me. The team also has a decision to make on wide receiver Brandon LaFell, who took an equally disappointing step backwards that seriously hurt the offense as they looked for production outside the numbers. If the team moves on from both players, they'll save an estimated $4.725 million in cap space. Bill Belichick the GM/coach will have to decide if that'll be worth it heading into the new season.